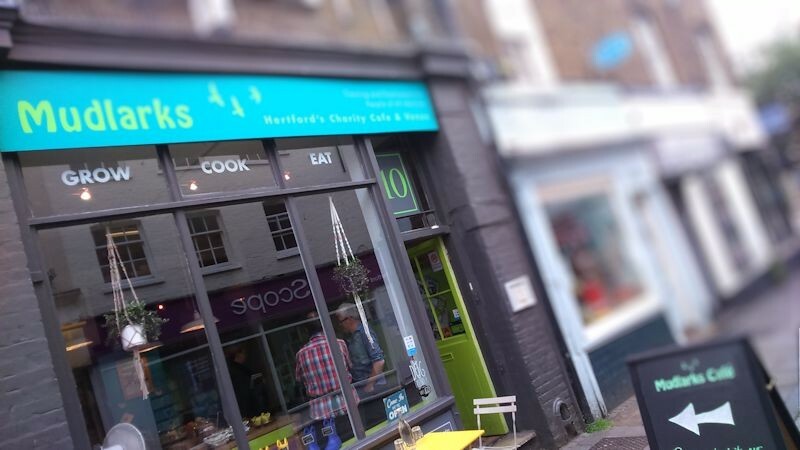 Opened in July 2014, Mudlarks Garden Café is Hertford’s only vegetarian and vegan café. Using locally sourced seasonal ingredients and produce from the Mudlarks allotment site, we serve a wide range of delicious homemade savouries, cakes and pastries. Situated in the heart of Hertford, we’re supporting people with learning disabilities and mental health issues to learn and work in our community. Wherever possible we will use produce grown on our Allotments at Cromwell Road, produce grown sustainable and organically from local suppliers and items obtained from the Fairtrade network. Mudlarks is Hertford’s community gardening charity. Our aim is to integrate people with learning difficulties and mental health issues into the community through gardening whilst also promoting conservation and allowing people of all abilities to learn and work together.